Derdack DE | Enterprise Alert® 2015 Update 1 is available! Enterprise Alert® 2015 Update 1 is available! We are proud to announce that Enterprise Alert® 2015 Update 1 is available and ready for download! Update 1 is our first major update for v2015 and contains a number of exciting new features and improvements, which I will introduce to you in this blog article. With Update 1, you are no longer confined to sending a single message to predefined recipients in your Emergency Callouts. Instead, you can enter as many messages and recipients as you please. To top it all off, you can also change the notification channel you would like to use for each message up to the point just before you raise the Emergency Callout! All this ensures that you have all the necessary options you require when raising a Callout. Please bear in mind that Emergency Callouts are only available if you have the applicable license. Once you have raised an Emergency Callout, you may wish to send updates to your Callout recipients. This may be for example if the circumstances leading up to the Callout have changed and you now need to let the people in your Callout know about this. Once you have sent your update(s), you can easily follow the status of these update(s) along with the original Callout messages all in one single chronological view. None of these new Emergency Callout enhancements would be complete without an improved way of configuring or managing your Callouts. 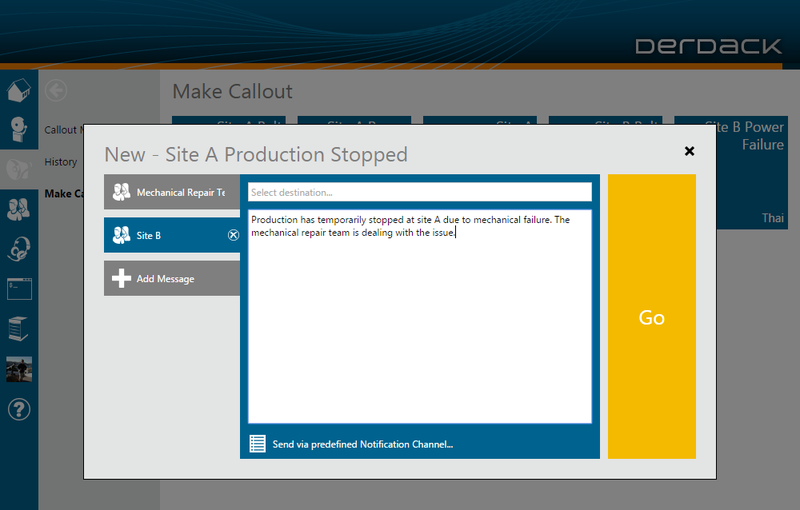 Firstly, the Callout management section includes options for configuring which notification workflows and channels should be used when recipients or messages are added „ad hoc“ to a Callout i.e. when messages or recipients that have not been preconfigured are added at the moment just before raising a Callout. 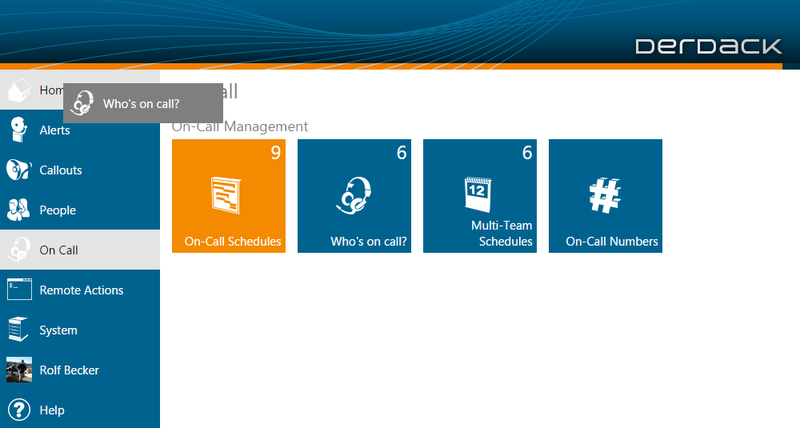 Secondly, the management section enables you to configure more than one message for a single Callout. 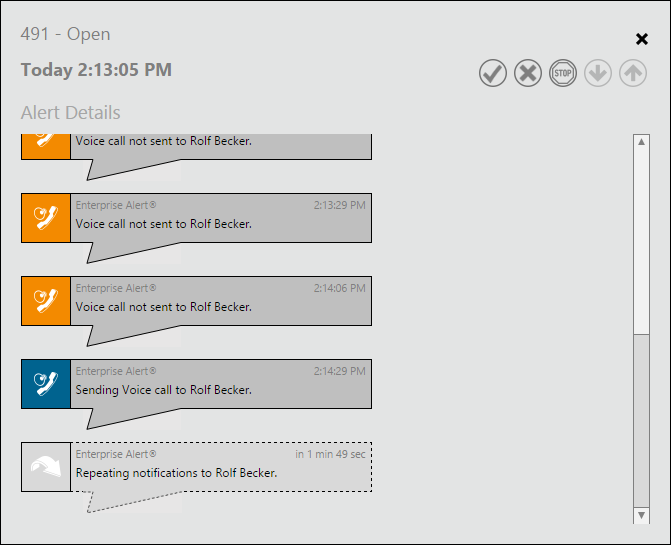 Here, you can intuitively set each message’s recipients via drag & drop. 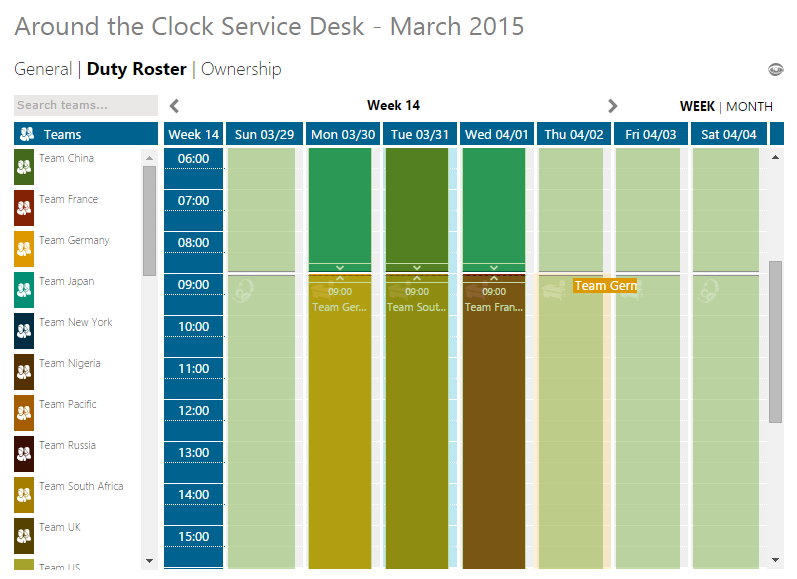 The Multi-Team Schedules have been reworked to include a new and modern calendar design. This enables you to more easily set up your team shifts via drag & drop and easily and intuitively resize each shift individually. Scenarios such as Follow-The-Sun or 24/7 availability are made more practical via an overlay which displays when teams are available e.g. when teams have business hours or are on call. This overlay shows the team’s availability even according to the time zone they are in. This is a great step forward for organizations that operate around the clock or across multiple time zones, as you can easily see the times that the teams are available according to their own time zones. Resizing individual shifts is also a snap. You simply place your mouse at the end of the shift and drag it to the slot where you would like the shift to begin or end. Last but not least, we have consolidated the holidays that were used for teams and schedules such that only the teams‘ holidays are taken into consideration. I am quite certain that once you have used the new reworked schedules that you will want to use this feature even more than beforehand and in areas that you might not have otherwise considered! A typical scenario for Multi-Team Schedules is where you have teams that are responsible for incidents as a whole at work, whereas individual team members take over responsibility for critical incidents after hours on a rotating basis. 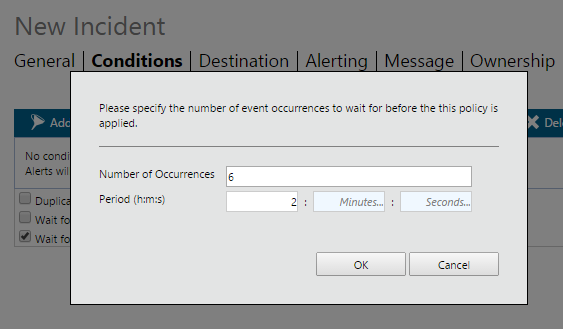 You can now set this up in an Alert Policy by selecting a Multi-Team Schedule as destination with Escalation or Broadcast as the Team Notification Procedure and then selecting “Use On-Call outside Business Hours”. It is possible that users may miss a notification from Enterprise Alert® simply because they are temporarily busy with something else or are not at their desks. This does not mean that the user will not shortly be reachable or available again. You can now configure your notification workflow to persistently iterate through the list of preferred notification channels or to continuously drop notifications via a specific channel so long as the user has time to respond. If the user only wants to have notifications repeated on a single channel, they can configure this by selecting their so-called “nag channel” in their personal Notification Profile. The criticality or occurrence of an incident may be determined by the number of associated events that occur. We have therefore built in a feature, which ensures that an alert is only triggered when an event has occurred more than a given number of times. This is particularly of interest in monitoring scenarios, because even healthy systems may generate warnings or errors now and again. An unhealthy system on the other hand can be characterized as continuously generating an excessive amount of such events within a short period. Alternatively, a system may be healthy most of the time and only becomes unhealthy temporarily. In other words, the unhealthy system generates some warnings and errors, but quickly recovers afterwards. In this case, unhealthy events can safely be ignored so long as the events are not continuously generated over a “long” period of time. This scenario clearly differentiates itself from duplicate suppression. With duplicate suppression activated, at least one alert is always generated when an event occurs, whereas in this scenario, an alert is only generated once the event occurrence threshold has been reached. Event sources such as System Center Service Manager or HP Network Node Manager typically use times in UTC, which is not very useful if you wish to use these times in your alerts, because you will always have to calculate what the actual times are in your local time. We now automatically convert all times to the times used in the local time zone of the user or team. The times displayed in the alerts also contain an abbreviation for the time zone used, so you can easily determine the exact time used if you work in a multi-time zone organization. When setting up holidays for your team, it is often the case that various teams share common holidays such as Christmas or New Years. We have therefore included the option to copy holidays from teams where holidays have already been set up. You can now preserve the HTML formatting of emails forwarded via Enterprise Alert®, provided that the corresponding Alert Policy does not modify the message’s body. This functionality however needs to be activated on the corresponding email Notification Channel, as it is disabled by default. We have included audio that is automatically played when the user is on hold, for example when a conference call is being initiated or when the user is waiting for the on-call team member to be contacted. This option is configurable under the hood and allows you to personalize the Enterprise Alert® voice service while the user is on hold. If you have requirements that go beyond the features provided out of the box by Enterprise Alert®, then you can use the Application Programming Toolkit for scripting your custom alert workflows. In this update specifically, we provide you with the option of modifying an event’s parameters before being used to trigger an alert. This is particularly useful when you wish to provide information in your alerts that are not provided by the original events. We have implemented a new help section with links to various introductory videos on all the main topics covered by Enterprise Alert®. In these videos, you can learn more about the features available and tips and tricks about how they are used in the product. Even if you are an experienced user, you can still find new ways of how the product can be of benefit to you in various scenarios. Whereas you could previously only pin a menu tile to your start page by right clicking on the tile and selecting „pin to home“, you can now simply drag the menu tile on to the left hand Home menu item. This allows you to quickly and easily customize the tiles you regularly use and which are important to you. 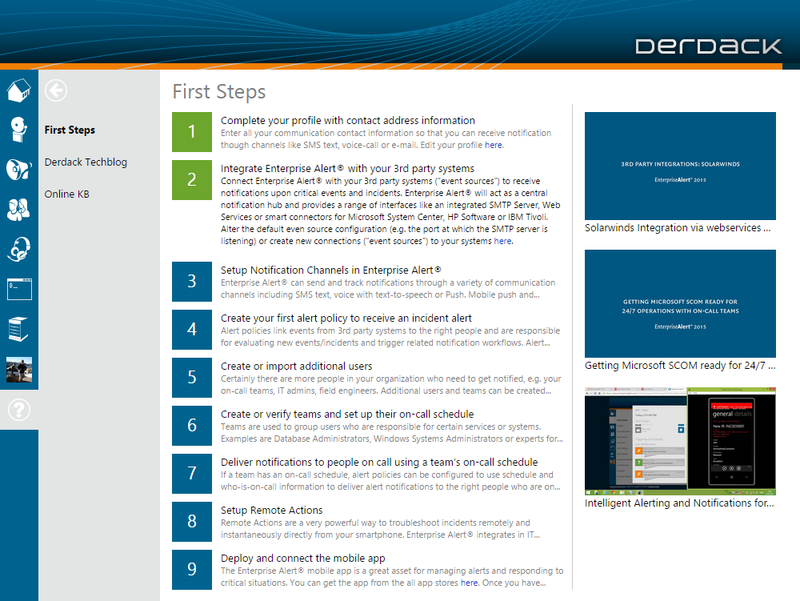 If you want to tryout Enterprise Alert® 2015 Update 1 you can request a trial version here: https://www.derdack.com/en/about-derdack/contact-us/. After you have downloaded the file, simply double click it and the rest will be done for you. If you are an existing Enterprise Alert® 2015 customer you can easily update to EA 2015 Update 1 by installing the corresponding patch (version 5.2.0). If you want to upgrade from Enterprise Alert® 2012 or 2011 to Enterprise Alert® 2015, you can simply launch the main setup file (EA2015.exe). The installer will recognize your existing Enterprise Alert® 2012 or 2011 version and upgrade it to version 2015 Update 1 automatically. We hope you will enjoy this first major release from Derdack this year. We wish you lots of fun with it and we are looking forward to your feedback!